Formula wise each one of them is just amazing, I can never complain about the formula of Zoya because they just not give me a chance to get disappointed. Solstice: Its a light coral with a bit of gold shimmer in it. this one was a one coater genius so I just went with 1 coat. Tawny: Its a coppery rose metallic polish with some golden bronze flecks in it. Love this colors as it complements my skin tone. Shown here are 2 coats with no top coat. Ming: It's a gorgeous rosy red creme. It's the absolutely gorgeous red you will see ever. I just loved it. Shown here are 2 coats without top coat. Blake: It's a dark navy jelly blue with golden shimmer in it. It looks really vampy and beautiful. Shown here is 2 coats, no top coat. Danielle: A Darker version of periwinkle blue creme. Shown here are 2 coats, no top coat. Delaney: It supposedly looks like a multichrome purple in the bottle, but when applied it didn't show any shades at all so a bit disappointed with that, but if you like purples, its a beautiful looking pearl polish. Shown here are 2 coats without top coat. Fallon: It's a stunning magenta pearly finish polish. this looks so so good in person than in camera, such a gorgeous shade for every skin tone. Shown here are 2 coats without top coat. Nadia Its a mettalic gold sheer polish, It can be worn on its own or on top of any color but I decided to wear on it own so here its 3 coats of it without top coat. Landon: It's a lovely grape purple creme. Shown here are 2 coats, no top coat. Kelsey: A fuschia pink creme. shown here are 2 coats, no top coat. Isadora: Its a stunning purple-magenta with a pearly finish. shown here are 2 coats without top coat. Sheri: A Gorgeous dark toned red creme. Shown are 2 coats without top coat. 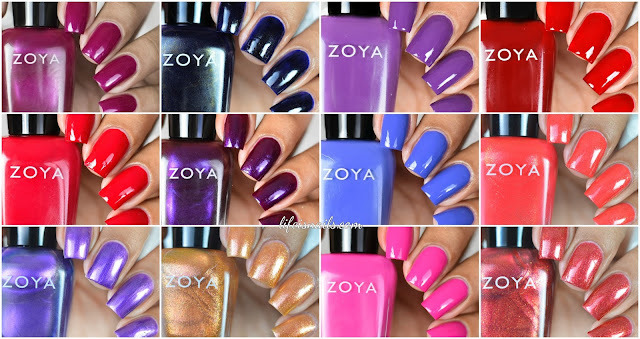 So here you have the Zoya Winter collection 2017! What do you think?